Remember, this is not about the President, it is about us and it is about why we have to pay more attention to the buffoons, in whose hands we place our nation. QUOTE OF THE CENTURY, MAYBE EVEN THE MILLENNIUM. It is that good. Here is the entire quote, and it is important for all of us-skeptics to recognize that it is not from a disgruntled American conservative. “Some people have the vocabulary to sum up things in a way you can understand them. This quote came from the Czech Republic. Someone over there has it figured out. We have a lot of work to do. Let me tell you why we do what we do. No matter what bad actors they are, when we are not paying attention, once for each election period, they reappear to gain the favor of our votes. Otherwise, they cannot and will not survive. According to an information tidbit making its way around conservative circles: At the close of business on January 4, 2007, Pelosi’s first day as Speaker of the House, the national debt was $8,670,596,242, 973.04 (8.67 trillion), according to the Bureau of the Public Debt, a division of the U.S. Treasury Department. At the close of business on Oct. 22, 2010, it stood at $13,667,983,325,978.31 (13.67 trillion), an increase of 4,997,387,083,005.27 (or approximately $5 trillion). Pelosi, aided by her Democratic majority in the House, added more to the national debt than the first 57 House speakers combined. Ironically, with all that money spent, Pelosi never saw fit to pass a budget and that’s why in April 2011, the government was squirming to get that done. Over the years, our “honorable” Congress gets reelected because as a rule we assign to these nasty creatures of self indulgence the same attributes as a far-off brother or sister who comes in for the gala graduation. In our hearts, we know that this particular brother or sister is not what mom and dad would have wanted, but, hey, they are ours! We are so glad they came! For Congress, the graduation occurs every two years; for Senators, every six years. For the most part, during the years in between, they simply ignore our letters and pleas, and when they do respond, they often demean our arguments. Yet, like clockwork, when it is time, they always show up for the next election. In our humanness, many of us cannot wait to share our best wine and the fatted calf with our kin (whoops, our prodigal representatives) during their short reelection season. They had returned, and after all; is that not all that matters? Sorry, Charley, that only occurs in real weddings, real graduations, and with real relatives. The fact is these guys are creeps, sponges, and exactly the kind of people we would or at least should not want at our fests. Yet, we feel honored that these rats have chosen our den, rather than where they belong. We are so willing to forgive and to please so much that we quickly lose our ability to control these knaves. And, they know it and they prosper from it. I think you got my point by now. How many graduations, first communions, or weddings can a rat attend without ever being seen as a rat? Drom my personal perspective, I regret that I watched it go on for at least thirteen terms in Northeastern PA before I ran for Congress in 2010. The incumbent kept reappearing and even after thirteen two-year trips to Washington, he was looking to make it 28 years and perhaps even more. Dear fellow Americans, isn’t enough, enough? The Germans say it quite well: Genug ist genug, meaning “enough is enough,” and they have this other neat way of putting it in better perspective with zuviel ist ungesund. This means “too much is unhealthy.” Yet, despite how unhealthy it is for us, our elected representatives come back time and time again, and instead of rejecting them, for our own reasons, we embrace them again, and then we reelect them. We clearly get the government we deserve. Each day more and more Americans wake up to realize that we actually have power in our vote and it does not help us to waste it on the dirty rotten scoundrels who pillage our country for their own purposes. We owe it to ourselves and our country to give all political representatives as short a time as possible in Congress. Perhaps the right number is no more than two terms for a Senator and no more than three or four terms for a member of the House. Anything close to thirteen terms is bad luck and a formula for bad government. Without term limits, the founders expected the people to throw the bums out as soon as they became too powerful for their own good, and for the good of the people. Term limits in some way is a form of citizen abdication on expelling those who want to be career politicians. Recognizing that career politicians are a big problem for America, we do need a better way of dealing with the corruption of otherwise good people by spending too many years in office. The popular idea of term limits certainly addresses the problem of lecherous career politicians. Yes, there are such things! Some might suggest that this is just a symptom of voter apathy and disinterest. I disagree. I see the notion of limiting terms in office to reasonable numbers of terms as desirable. It would be nice if the office holder recognized they were no longer welcome, but with their ever growing egos, there is a fat chance of anything so simple ever overcoming their greed. Why do they keep getting elected when smart people like you and I do not really want to bring them back? The answer is simple. We are not trained charlatans and we are not experts in charlatan detection. Normal people do not tune into the deceptive ways of the politicos. We joke about it for sure but deep down; most of us do not believe these guys are as sinister as they actually are. But, they are. Moreover, you and I have other jobs. Their full-time job -- the job of the politico is to snooker us into thinking they are the best... and that any change in representation would be like suicide on our parts. Yes, they do try to scare us into submission, and often, depending on how prepared we are, they succeed. Have you ever heard them say the other guy will hurt Social Security or Medicare, or Madicaid? The other guy will not fund the cure for cancer and the other guy will take away any benefits that you have worked so hard to achieve? Until we train ourselves better, the fear mongering of the politicos to serve their own greed will beat us every time. They say the devil you know is better than the devil you do not know. With regard to politicians, try another maxim: If you know the devil you know, replace that devil with anything -- hopefully somebody who may never become a devil and who knows that you are watching. For the macho among us, the other strategy they use that is appealing even to us. These bums make us part of the “victory team.” Of course we want our team to win so we are easily duped especially in the middle of football season. So, as they always do, they make a contest out of the upcoming election. It is like the big game and we must win the game. If we are associated with a politico who has not really messed up (not whether they did a bit of good or not), or they just messed up a little, but they are sorry, we find ourselves on the team again as linemen, backs etc. Yet, these people are not the ones for whom we should want a victory. We were there last time for the big V and of course we will fight for victory again this time. We will win! But, when our macho lets us get sucked into the politicos trap, we never win. They win for sure and we have to be smart enough to see it coming. We are not part of their team and we should not want to be part of their team. If anything, they play for us, and if they are poor players, or they have been around too long, it is time to dump them. And so it seems in this scenario, the system must always stay corrupt. The only solution against this scenario is to assure you always bring your own mind and your own thinking back home. Don't trust politicians for anything, especially those politicians who have become expert in their game of deception. Don’t be swayed by corrupt politicians like the children of Hamelin who followed the Pied Piper to their graves. The political piper’s path is one that only leads to misery. Rather than complaining two days after the election that the guy you voted for is still a creep, check it out ahead of time and send all the creeps packing before the election. Don't go winning the big game for the creeps just because it feels good! Built-in flexible term limits – the solution. The problem the Founders never saw is that scoundrels could be so likeable. Chalk that up to modern culture and a time in history in which the scoundrels who convined the emperor that he had no clothes could do just as well but in a different venue. Unfortunately, instead of duping the arrogant emperors, in this day's version, the potential emperors would be seen duping the public. You've seen them in action as have I. They don't even care if you see they have no clothes as long as you love them and worship them and you are resolute to win for them. If the emperor of old can be duped and we can be duped regularly by politicians, knowing how educated most of us really are, then our system needs some duping preventative. The bad guys, who know how to dupe the citizenry, and how dupable we are, must be wiped out of office before they cause too much damage. Since we have a tough time doing this without any help, let our legislators put forth a law that helps prevent the bad guys from permeating our Congress. This i snot necessarily the best method. For sure, the best method is for the citizens to recognize the rogues and never permit them in and/or get them out quickly. Are we all in agreement that has not worked? Let's first examine how this would work for a member of the House of Representatives. I would suggest some derivative of the following: Each time a House candidate wins a particular office for the second time, in order to be reelected again (the third time), they should be required to achieve 5% more votes than their opponent. Each subsequent attempt at reelection should require a cumulative 1% additional vote separation for each additional year. So, in a reelection attempt for a fourth term, the term limits rule would take effect again. Of course it is for the incumbent only. What does that mean? When the incumbebt runs for a fourth term, nothing prevents the incumbent House member from winning if they are very popular with all constituents, not just a base of citizens that they have helped. These citizens may have been from their home areas but it doe snot even matter.. In the fourth year, the third year incumbency penalty of 5% would kick in and the one percentage per year penalty after the third term would kick in as 1 for year 7 and one for year 8. So, to achieve victory in the fourth term, and incumbent would have to defeat a challenger by 7% -- 5% plus the 2% for each term sought. If the popularity of an incumbent continues to increase, it would permitt the incumbent to stay in office if they overcame the incumbent penalty. 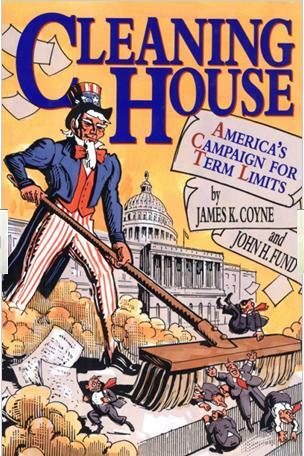 If their popularity goes down, a lesser known candidate who had never been able to give anything, such as a job or a permit to water or land, to anybody hoping to create a cadre of loyal voters, has a chance to overcome the loyal voters pehenomenon that the Founders did not account for keeping incumbents in office. Therefore, a good person who is not a politician can beat a politician with no giveaways, with no people in her or his pocket, or in his or her bag. And, so, the people's chpice may be able to represent the people. So, let's say that there was a 13-term Congressman running in your district for a fourteenth two-year term. That would mean that this Congressman would need to get 5 + 20 = 25 more points than the challenger in order to continue in office. As you can see, at some time around the sixth or seventh term, it gets fairly difficult for a candidate to win reelection. Thus, the objective of term limits is served without having hard and fast term limits. Senate rules could be fashioned in the same way without us having to do any more calculations. Many who cast deciding votes believe that the fact that the people love a candidate should not be any reason why the candidate should be penalized for the people wanting to reelect him or her year-in and year-ou. They do not see twenty-year politicians who become bosses of their areas as their problem. I would suggest this is because the boss is on their side, not necessarily because the boss is best for all the people in the district. They think they are America-astute enough to vote in each election and vote for the best person. Politicians often argue that they would support term limits if the people of their district really wanted them. Unfortunately, politicians do not address the underlying issues that lead to a lack of participation by voters in the election process. Some argue that term limits remove the voter from his/her responsibility to hold elected officials accountable. Some others argue that when term limits are applied strictly, good politicians (perhaps an oxymoron) are tossed out with the bad, based on their years of service. The truth recently is that if the few good politicians were to be thrown out with this mostly bad lot of actors in Congress today, it would be for the good of the country. The Founders thought the people would be smarter than we seem to be. They could not imagine that we would put the same corrupt representatives in office time and time again. Term limits were supposed to be determined by the people by not reelecting scoundrels back into office. We the people are at fault for that. We are to blame for sure. If we limit salaries of representatives, that would make it hard for the middle class to represent us. That is therefore a bad idea. Then, only very rich people would hold office because they'd be the only ones who could afford it. So, we have to be careful. I would look to see if setting the salary lower for each year in office might be a natural way of creating term limits. Maybe that would be OK. But, then again, the rich already have wealth and such a method would help them gain power to accompany their wealth. Again, the middle class would be less likely to run for a low salary unless they had been able to accumulate wealth in office – clearly another unpleasant thought. I would look for other natural mechanisms but again the best control is the people who, hopefully, would be paying attention and keeping the bums, once discovered as bums, from ever getting reelected. Yes, it is our job but many wish to believe that everybody is honest. Unfortunately, the longer our public servants serve, the longer they want to rule, and the higher the probability that they have been exposed to corruption, and the higher the probability they have succumbed to the sordid opportunities inherent in power. Another issue such as term limits in the House and Senate may have regarding voter perception is that the committee system in place now is seniority based. Therefore, if everybody is getting pork, theoretically none would come to the districts or to the state if the people elected a first termer. This may bother the people but it should not bother the candidate. A representative should not be selected for office if the only concern is local pork. There should be no local pork for any district or any state. Let the states fund their own operations. Why send money to Washington to get just a few pork chops back? Things are getting so bad in our country that most of us are already second guessing our election decisions. How much is all the pork in the world worth if you are not free to enjoy it at the exact moment of time that you want it. Is it possible that the liberty and freedom to choose such things are part of this coming election? Go ahead, I dare you to go out and place your tongue on that salt-lick in between bites when none of the enforcers from the government are looking and after government regulations have made salt shakers unlawful. Term limits, in theory, may result in committee chairmen, who are first-termers, who are relative rookies. That could create an issue but would it not be better than the corruption we have now. The committee system should be based on merit anyway, and not necessarily based on seniority, like most well managed businesses in this, the information technology age. Anyway, if Americans are all alert, and the 112thCongress does not serve us well, there may be 435 new members of the House and 33 new members of the Senate. The key thing for us all to assure is that the voters are involved (that's up to all of US). Though in normal elections this would not matter as much, because the US is really in bad shape economically, this time we must make sure all are tuned in enough to be part of the overall process. The objectives of this process are simple: keep 'BAD' politicians from getting voted in on election day. In my book, Taxation Without Representation, I wrote a whole chapter discussing the notion that "We get the government we deserve." The objective from now on should be that we need to be part of the process so that we deserve better than the poor stock or the recently corrupted stock of politicians we have gotten. Then we will get better representation. So, the solution is probably not limited only to term limits, which puts the election process on an 'autopilot' to noplace and in many ways disengages the voter. However, until most voters are engaged for real, term limits of some kind are a good idea. We know that in many cases, privileged voters may have been bought off by jobs, promises and future opportunities. Since most voters admit to not tuning in, the term limit notion described above, which would extract an incumbent penalty for each year in office, clearly can overcome voter apathy. With incumbents requiring more votes, we reduce the advantage of the incumbent entrenched career politician over a challenger from the people. This makes it a good idea. Unless the people really fell in love with a politician, after a number of years, the margin of victory with the incumbent penalty would replace them. A self purging system to eliminate corruption is a good idea. Regardless of whether the government wants to fix this problem or not, the message to us all is that we must pay attention. It is our fault that it got like this and more importantly, it is our fault if it keeps getting worse with our choosing to keep the same bums in office. Let’s change the system to one that works but in the meantime, the best term limits are easily enforceable simply by your voting the bums out.